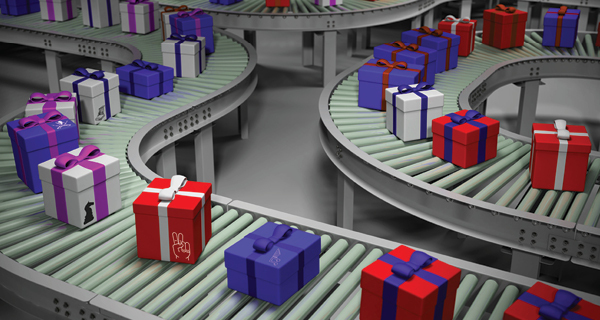 To help subscription box services manage orders amidst rapidly increasing demand, logistics providers bring the whole package—from kitting and tying bows to delivery and returns. Subscription boxes are the e-commerce age answer to the Fruit of the Month Club. From cookies to clothes to crafts, there's a subscription box service for just about everybody. Eating gluten free? Gotcha covered. Sports fan? No problem. Comics aficionado? Might be hard to pick just one. Box subscribers pay a monthly fee to receive a package compiled according to a number of content models. With the "curated" option, subscribers provide no input about what they receive. In another model, subscriber input is controlled through a profile that contains their answers to questions that vary according to product category—skin type and tone for beauty products, for example, or preferred fiction genres for books. In yet another option common with clothing boxes, subscribers preview the service's selection and make any necessary changes before it's shipped. Many companies ship on a shared drop date so customers get their boxes at the same time—a must when social media reveals are part of the brand experience—while others ship on the subscriber's order anniversary date each month.